1. Is Cordova the one where the vehicle thrown left an impact crater upon landing, and if so, are there any photos available of the crater site? 2. I have seen the Guin’s path length estimated at 79.5, 102 and 103 miles long. Which one of these is likely the most accurate? I keep reading that it had the longest path length in the Super Outbreak, but for some reason, sources conflict on just how long that path was. John – thanks, those definitely were typos. I wrote this entry much faster than normal. 1. Yes, it tossed a 4,000 lb utility trailer a mile and left a dent in the dirt. I haven’t made any serious effort to find pictures of that specific incident, but the NWS didn’t include a picture of it so I’m guessing it would be hard to find. I added some pictures in my first post (’74 Outbreak vs 2011 Outbreak) that show the ground scouring southwest of Cordova. 2. Tom Grazulis discussed the Guin path length in “Nature’s Ultimate Windstorm” and settled on 103 miles, I believe. The longer path farther north is now considered a tornado family. You’ll find a little more information on the tossed trailer, including the location it was set down, at BMX’s GIS page; scroll down to the interactive survey map and zoom in to the more significant of the Walker county tracks, SE of Jasper. And I don’t think this photo will link, but here’s about where it landed, near the highway about halfway between Cordova and Sipsey. The photo did link, and while the dent is clearly noticeable, the photo as a whole doesn’t seem to be of the best quality. I can see the trailer, yes, I’m just surprised that NOAA didn’t upload more pics of the site. I can’t tell if the trailer landed on its side or if it is propped up against some sort of landmark. Nonetheless, thanks for the link. This photo looks impressive too, although not sure what type of vehicle it was. What an interesting article. Thank you for putting this all together. I never realized how fast-moving the Smithville tornado was until I watched that video and paid close attention to how far it moves by the end of the clip. Looks like it made it all the way to the distant horizon in only a few minutes. I was just curious, why didn’t you go with the official number of deaths with the two tornadoes in February of 1971? According to some sites, at least one of those tornadoes did cause more than 50 deaths. 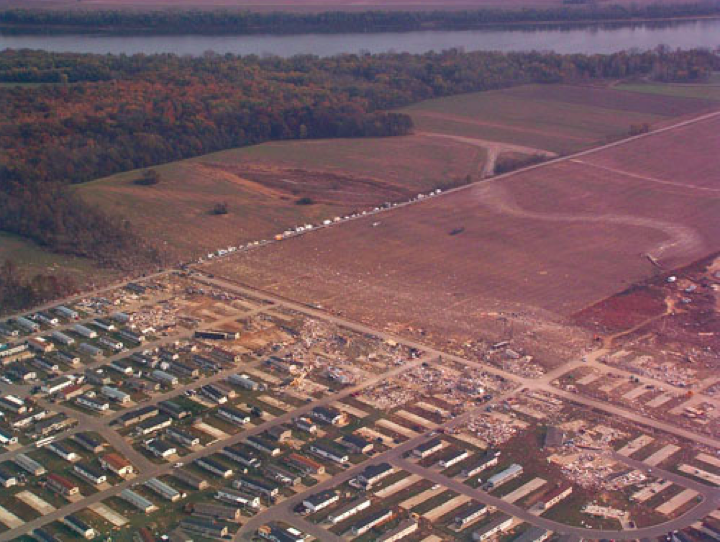 Lee – the 1971 Pugh City tornado and the 1966 Candlestick Park tornado both “officially” caused more than 50 deaths, but both were quite likely tornado families. I did my own research on the storm’s and removed the fatalities that were likely unrelated to the primary damage path. Awesome article as always. Incredible stuff. I had never heard of that anticyclonic deadly F4 – that’s AMAZING. And I didn’t know the railroad car was thrown that far in the Tuscaloosa tornado either. An awesome compilation of rare records. So much good stuff on here. I spent the better part of my afternoon reading everything on this blog. I know you discuss the Ivanova, Russia tornado that struck in 1984 a bit in another post, but I would love to see more about it on here. I would also love it if you could find any pictures of the damage. I know the tornado lifted heavy construction cranes that weighed 710,000lbs over 200 yards – you do not have that listed as the heaviest object ever lifted by a tornado, maybe because there are no pictures of the damage. 1. The Wichita Falls tornado of 1979. 2. 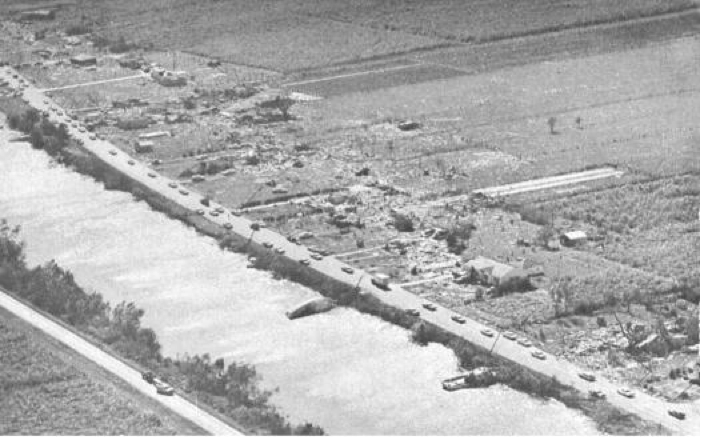 The Worchester tornado of 1953. 3. The entire Super Outbreak of 1974. 4. 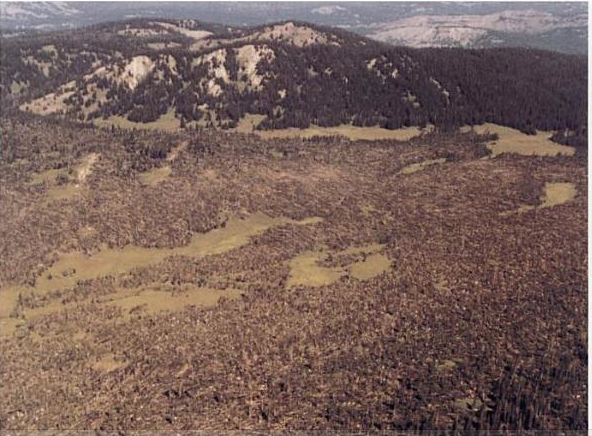 The Woodward tornado of 1947 and the Udall tornado of 1955. 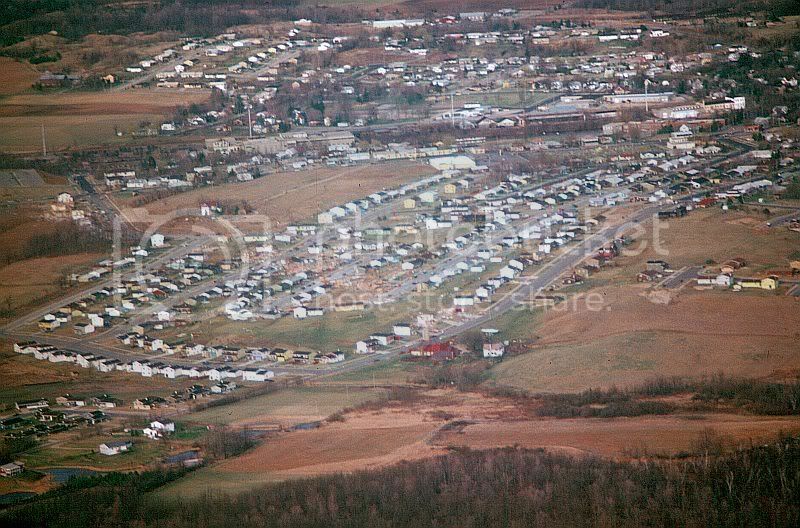 Nate – the Ivanova tornado outbreak was surely an impressive event, but all the information on the damage does not pass the litmus test I try use for all the material on my blog i.e. it is not “verifiable” and therefore not suitable in a list of “accurate” tornado records. I hope my website is a place where people can trust everything I write about as almost every severe weather related resource is filled with subjective or false information. I have a hard time believing a tornado in Russia, which hasn’t had a single high-end EF2 tornado documented in decades, caused unparalleled damage to massive industrial equipment and “steel-reinforced” buildings. For all we know, a crane that was 600ft tall may have just tipped over (therefore it reached as far as 200 meters away) and a shoddily built concrete bunker had walls that caved in. If it weren’t for the Phil Campbell and Joplin tornadoes, the tuscaloosa tornado would be by far the most damaging and deadly in the past 50 years. I think the storm was an EF5 in Alberta City as well as in Concord, so it was at that strength for 40 miles! I think it would be considered one of the strongest ever if it had been called an EF5. The way a tornado is rated changes the way we look at them. I agree. The tornado was likely at high-end EF4 or perhaps EF5 intensity all the way from Tuscaloosa to Pleasant Grove. Fortunately for local residents, the tornado hit next to nothing while at peak intensity and maximum size between the two cities. If the tornado were to have occurred by itself, I believe it would have been given an EF5 rating and universally been considered one of the most impressive tornadic events in history. The 2011 St. Louis tornado was reported to have levitated a 757 airplane. Wouldn’t that be considered the heaviest object ever picked up since 757s weigh hundreds of tons? The 2011 St. Louis tornado was rather weak (EF1 or EF2) when it passed over the airport, so it is very unlikely the tornado completely lifted the 747. The witness reports in that article are also inconsistent with the plane being completely airborne – the main interviewee says the plane only moved (slid) 20ft. I guess the subtext of my “heaviest object ever lifted” record is the object had to be moved a significant distance. Equipment in excess of 1 million pounds has been moved (construction cranes collapsing, drilling derricks rolled, bridge spans falling) but few things in excess of 30,000lbs have been thrown more than 100 yards. An EF-2 in San Jose? That is unusual.. I live in Wisconsin, sorta the far northern tip of “tornado alley” and an EF-2/EF-3 is the strongest we get in a typical year. Yea it was quite a freak incident. Sunnyvale is a good-sized city too. We are so used to perfect weather here. Quite bizarre especially considering the Bay Area’s very mild climate. There was also one that hit Los Altos (also close to san jose) on the same day. Hypothetically speaking, based on the strongest winds ever recorded in a tornado, what would be the heaviest amount of weight that they would be able to fully lift off the ground? That’s a mathematical question. The greater the surface area, the greater amount of pressure wind can exert. So there’s theoretically no set limit. In regard to the 2013 El Reno tornado; it seems the path width given for this tornado was determined based on doppler radar. If radar measurements count now, then why isn’t the Mulhall tornado now listed as the widest on record? I believe the estimate was based off of ground damage, as well as the many videos of the tornado. how strong do you reckon the winds were for the 2011 el reno tornado when it toppled and rolled a 2 million lb oil derrick? Could something that size have been picked up if the winds were even stronger? Probably over 280mph for a second or two, hence the rather narrow swath of extreme damage. Extreme winds can lift basically anything of any weight if the proportions are not aerodynamic. I’m not sure if a tornado could lift an entire 2 million lb drilling rig , but I wouldn’t say it’s impossible. It may sound like a silly question but could whole houses that have been picked up by tornadoes before disintegrating in the air count as some of the heaviest objects picked up by them? Not sure how much the average house weighs but I’d imagine hundreds of thousands of pounds depending on the size. I think the Elie tornado picked up a whole house before it fell apart midair. Yes, tornadoes have lifted entire homes, churches and factories into the air before ripping them apart – or sometimes dragging them 100 yards or more while keeping them intact (I know ’99 Bridge Creek did this) but I guess in such cases it’s impossible to know exactly how much it all weighed. I’m sure building/building sections heavier than 50,000lbs have been lifted into the air in this manner, but this might occur in every EF5 tornado that strikes a decent number of homes. How often do you choose to do articles on an individual tornado? I see some of the most recents you’ve done were on the Joplin, phil Campbell, moore, and el reno tornadoes but I was curious if you would ever do one on the 2011 el reno tornado? I am still amazed at the destruction it caused. Do you know what else it did besides destroying the oil derrick and mangling cars? I heard an above ground shelter at the oil rig site was damaged. Do you know if that had been directly hit as well? I have a few paragraphs on it in “The Indefinitive List…” Part II. I’d like to do an entry on it solely once I get some time off school/work. The November 1992 outbreak also spawned an F3 in North Carolina that apparently had a path length of 160 miles long. Haven’t been able to find much info on it beyond this, however. I checked that one out and it appears to be a family of three or more tornadoes. The fact that it remained fairly weak throughout most its path, caused no fatalities and little damage and spent nearly all of its time in unpopulated areas is strong evidence that the storm, like many, was a family of tornadoes falsely recorded as a single path. I know you mentioned the potential for a 4-figure death toll if a sufficiently violent hits a large population center, but do you think the potential 5-figure death toll mentioned here is realistic? Considering a Mulhall-type tornado in a major metropolitan area? I know you think that Enhanced Fujita scale underestimates wind speed, so what do you think the size of the EF4+ damage swath for that tornado would be? I mention that article in my “downtown tornadoes” entry. Yes, it is very possible that a large EF5 tornado could lead to over 10,000 deaths in a major city. While the Joplin tornado caused catastrophic damage, the city of Joplin is just a speck in comparison to the larger metropolitan areas like Dallas, St. Louis, Chicago, Cleveland. Such a scenario is most likely if a long-lasting, fast-moving EF5 tornado (like Phil Campbell or Guin) followed a crowded freeway corridor during rush hour traffic, which happens to coincide with the maxima in daily tornadic activity. this is just the top of my head I could be gravely wrong. Do you think the Yazoo City tornado may have been capable of causing EF5 damage as long lived as it was? How about the other two long lived 120+ mile tornadoes you have during the April 27, 2o11 Super Outbreak? The Clinton, Arkansas tornado on February 5, 2008 during the Super Tuesday Outbreak I suspected was capable of causing EF5 damage. It produced mid/high EF4 damage in several areas along its path and even some vehicles were never found. Do you know whether or not if the Kansas/Nebraska F4 tornado on March 13, 1990 was a family of tornadoes or a single tornado. There are claims that it was on the ground for 2 and a half hours and had a path length of 131 miles. It occurred the same day as the infamous Hesston, Kansas F5 tornado and the Gossell, Kansas F5 tornado. Them two tornadoes I know were part of a tornado family. I wonder if the long lived tornado may have been as violent as the Hesston and Gossell tornadoes. It formed in an unusual environment with marginal/modest heating and moisture. The temperature was like 67-68 degrees and the dewpoint was like 56-57. I was 9 years old when this happened and even remember them saying on the news a tornado was on the ground for 2 and a half hours that started in Kansas and went up to Nebraska. It was believed to have crossed several counties. I just did a quick search and found someone on talkweather mentioning that Grazulis thought the long tracked storm was a tornado family. My copy of Significant Tornadoes is back home in my old room, so I don’t have that on me to verify that but I believe that was my reason for not including it. As for the Yazoo City tornado, I haven’t done too much research on it but I do believe it must have been capable of causing EF5 damage at some point due to the massive swath of EF3/EF4 damage it caused. Same probably goes for all of the other long tracked tornadoes listed above, particularly Cordova based on some of the ground scouring pictures I’ve seen. I can confirm that Grazulis lists it as a tornado family. I was under the impression that the Wichita Falls tornado killed 42 people, with the other three being indirect. That might be the case – though I could almost swear I read an article which said that three deaths were later attributed directly to the tornado by a researcher. If I can’t find that, I’ll revise it down. I found what I had been remembering. Grazulis mentions three deaths from heart attacks. Am I the only person getting strange conversation replies on this list? I think someone hacked into my computer!! There’s replies that show up on my email that has nothing to do with tornadoes. It’s not you, it’s random spammers on my blog. Once you get over a certain number of daily views the spam bots come in – strangely their messages often are semi-relevant but always kinda incomprehensible. I haven’t had too many in awhile but I’ve had to spam more than 40 messages today. If it keeps up I’ll have to change my settings so that I need to approve all messages. The messages are posted randomly – as replies to comments, as replies to pictures – and they’re harmless if ignored. I don’t know what to think about this. Is it even remotely possible? It’s definitely theoretically possible, but the car would likely be completely fragmented within the first few miles. Long distance (2 miles+) travel of a heavy object implies multiple instances of contact with the ground – as in the car being hurled against the ground, rolled violently at great speeds and then re-lifted into the air. I believe the story may be failing to mention that a “car part” was found in Vilonia, not the whole car. Or it’s false entirely. 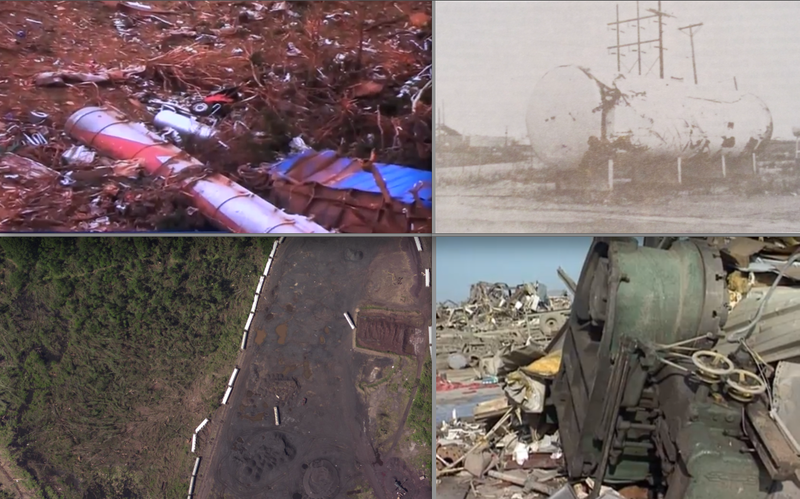 And I can’t remember if it was you that asked, Buckeye, but I added pictures of the safe and truck that were thrown long distances from 1608 Lingerfelt Road during the Rainsville tornado (in the Rainsville damage post). The Robinson family contacted me and sent me hundreds of pictures that I plan to use for an article real soon. I saw one meteorologist on a forum mention that it could have been stripped down to the chassis and that is all that was found. I’d say that is a fair bet, as I have seen that happen several times in violent tornadoes. Such a thing may be the result of the “telephone” effect. I recall that playing a role in the 2012 Henryville tornado, where a baby was erroneously reported to have been carried 10 miles and initially survived. I would guess that perhaps the license plate was carried and perhaps the truck itself was carried a much shorter distance. I had also heard reports that a storm shelter was lifted from a basement, though I have some doubts about that. Awesome news and the picture is incredible to finally see. Can’t wait for the article! http://www.koco.com/weather/experts-investigate-safe-room-tornado-death/25775010 Would this automatically signify EF5 if it was a safe room built to FEMA standards? Dean – I hadn’t seen that yet, exams are absorbing all my time. In short, that is incredible. 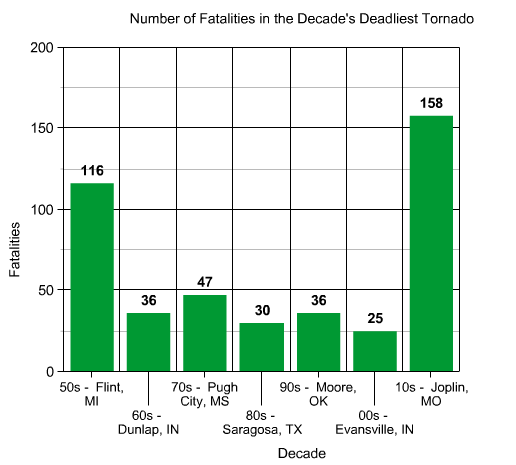 With the death of three professional storm chasers in 2013, 158 dead in the ’11 Joplin tornado, and now this death in a safe room – I can’t help but think the tornadic lull that characterized the 60’s – 00’s has come to an end. I standby my assertion that this tornado was an EF5. It will be added to my “Indefinitive List of the Strongest Tornadoes” in the coming weeks. This single instance of damage is not proof of EF5 intensity, but if the safe room is shown to have been up to FEMA standard – I would consider it an “incredible phenomena” worthy of a top ranking. In regard to the deadliest tornadoes, going int the really old records, I was looking over an entry in Significant Tornadoes and found something odd. Grazulis lists the 1860 Comanche, Iowa tornado as having 92 fatalities, but adding up the totals from the description, I get 115 deaths. What do you make of this? There’s some very interesting information here. I was wondering about the exclusion of the 1973 Brent, AL tornado from the “Longest Tornado Damage Paths” list. It’s a post-1970 event, traveled ~139 miles, and unlike some other historic very long-tracked tornadoes (1966 Jackson-Leesburg, MS, 1971 Pugh City, MS), I have never heard this path length contested or seen evidence suggesting multiple tornadoes. I know plenty of recorded information on tornado events are often incorrect, even in official sources. So was there something particular about this event that led you to conclude the path length was less than reported, or did it just slip by you? There’s some very good information here. 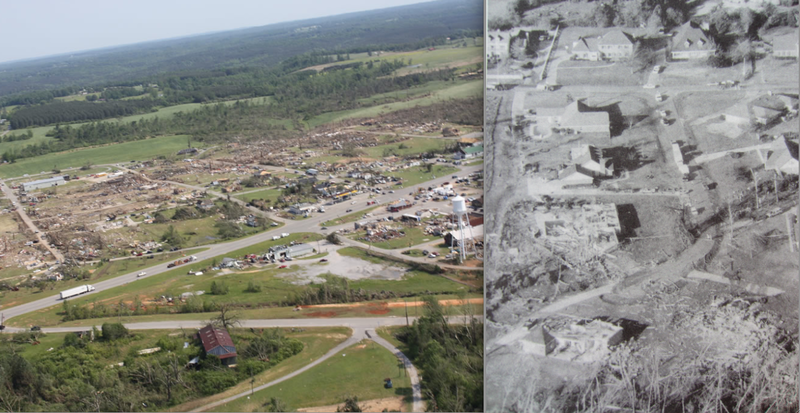 I was wondering about the exclusion of the 1973 Brent, AL tornado from the “Longest Tornado Damage Paths” list. It traveled ~139 miles, was a post-1970 event, and I have never heard of it referred to as a suspected tornado family like the 1966 Jackson-Leesburg, MS or the 1971 Pugh City, MS events. I know there is much misinformation when it comes to tornado records, even in official sources. Is there such a reason it’s not on this list, or did it just slip by you? Tornadoes are crazy things, aren’t they? I’m not sure what got me interested in the weather but I will tell you this it has always been a fascination of mine how a tornado can take a 4000-pound pickup truck and throw it hundreds of yards through the air and wrap it perfectly around a tree.